I have no idea what I will do with this yet...so it will sit in the completed project box for a while. Someday I will do something with the pile! 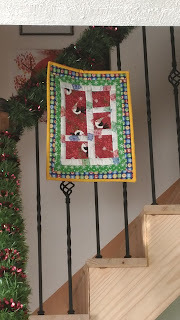 I also started learning how to machine quilt this week. 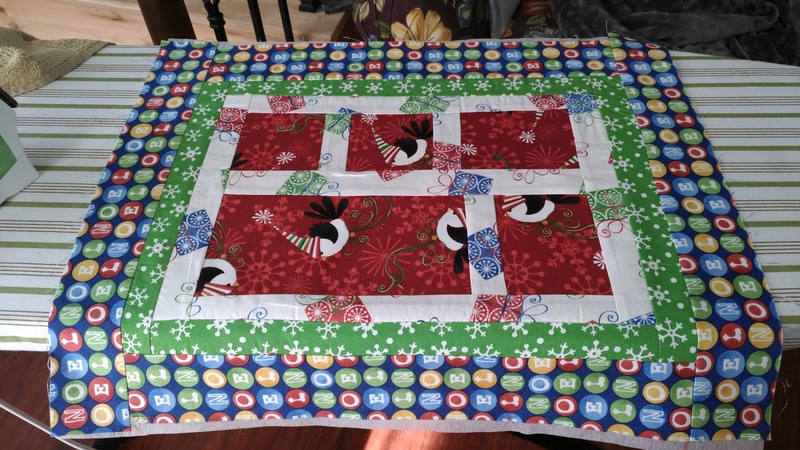 This is the first time I have tried freehand quilting. 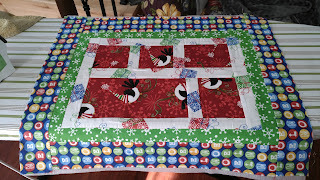 My first efforts are a little rickety, but I expect I will improve as I work my way through the quilt. I am taking a little time working on my Art Deco alphabet saga for a bit. 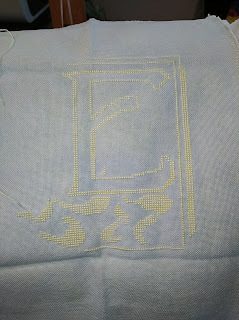 I am working on the letter E currently The colors are subtle and interesting. I am hoping to make a lot of progress today between the Sunday errands. It was quite a dangerous day today. First there was the stabbing...I received the sharp end of the stick, as it were, when I was trying to fix my siding today (which I gave up on) using a 4x4 and got a good 3mm splinter. Then, I was tutoring and in my excitement to teach about pancreatic issues, a bloody mess occured due to a nasty paper cut. Finally, while I was stitching, my cat was possessed by the spirit of a cougar...an angry, angry cougar. Fortunately, no tendons were damaged. I did, however, sustain a tiny little bite and a couple of irritating scratches which became quite inflamed for about 15 minutes. I decided it was best to maintain my distance and nap for a bit. I am thrilled to have completed this one. I really enjoyed working with the natural coloration of the threads. 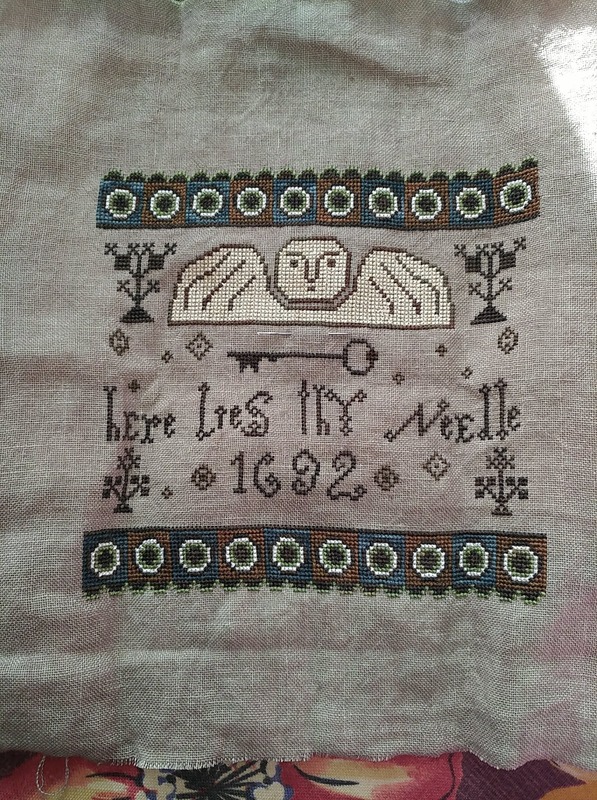 For this project I decided to use a pile of the Silkweaver Solos I had in my stash (mind you this project was started in 2007, I think) and a single color hand-dyed thread for the whole letter. Mostly this is because I feel that the letters are lovely and, indeed, should be stitched in a single color to show off their form, but that there is no way I would ever be able to stitch 26 100x100 projects in black on white fabric. If that isn't a sure way for someone to commit harikari...well, it pretty much is. So forget that. 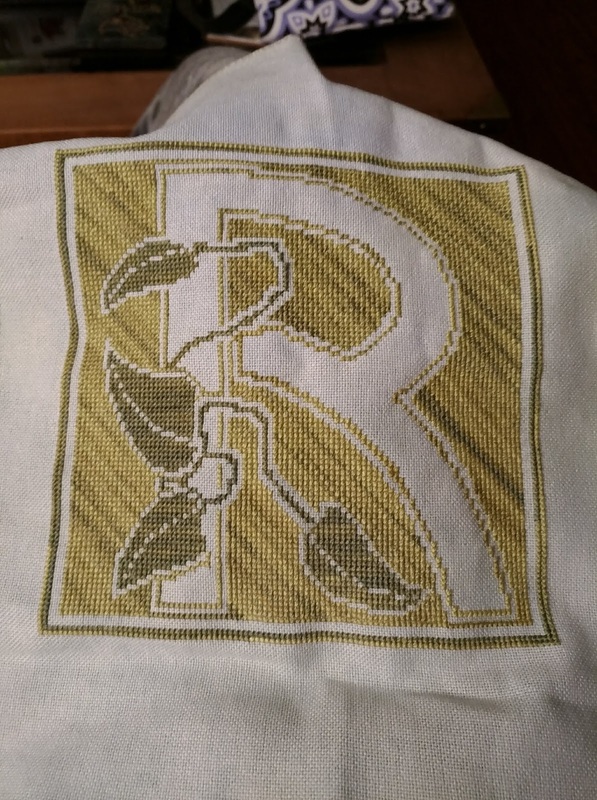 This particular letter, as you may note, appears to be stitched in two different colors of green. Mai non, I just pulled out some of the darker portions of the thread for the leaves. Aren't I quite the sneaky one??!! I was planning on starting the letter E next, but based on the converation at the shop I think it might be best if I start on the letter O. It was determined by the group that is is a rather creepy letter as there are a bunch of eyeballs on it. 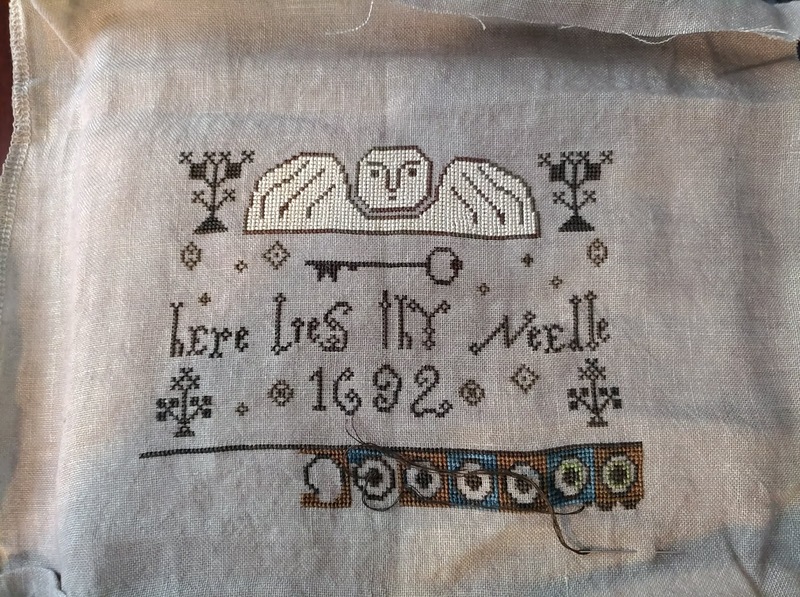 I was thinking that if I was to save it for last I would never finish the project because that letter is possibly cursed and that it would result in an untimely death, thus leaving the project uncompleted. Maybe it is best if I just get it done! I actually have completed a bit more than this, but I take the photo when it occurs to me. With that I shall now sign off. I had the flu recently and it has quite wiped me out. I am hoping tomorrow I shall awake refreshed and ready for a full work day. Be Well! I think my new motto will be "two steps forward, stand your ground till the nonsense passes, keep going". It's been a good year so far. I passed the first of my three certification exams for my Wound, Ostomy and Continence certification (CWOCN). I am really enjoying the work I do and have learned so much in almost a year of this. I decided to go back to school part-time in the fall to work towards a Nurse Practitioner license. I am starting the process of getting a few things fixed around my new house. I have been able to even take time to relax and work on some projects. 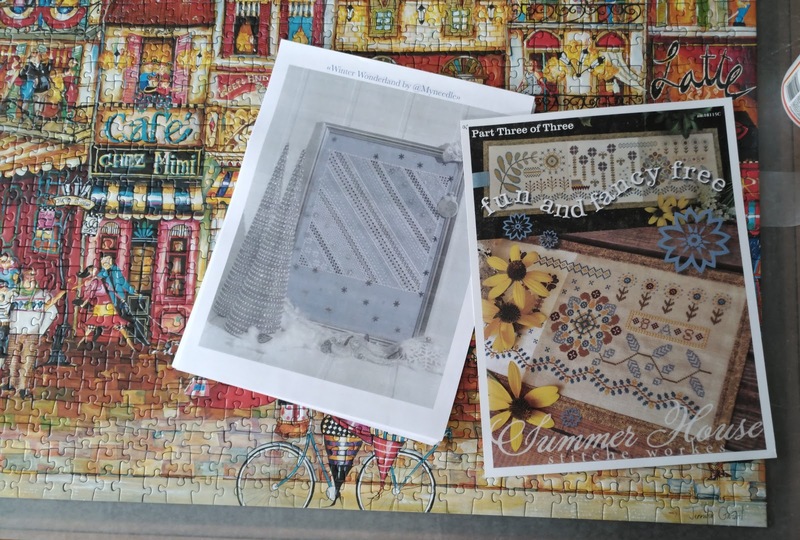 My quilting journey is definitely enjoyable, but I am still making time to cross stitch. Sadly, no photos since the lion (which Matt enjoyed as a late Xmas gift). I have made significant progress on my Letter R for the Black and White art deco project (which is nowhere near black and white) and on my Thy Needle project. 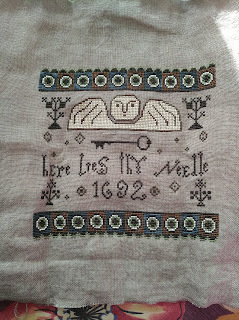 Hopefully I will have a new pic to post in the near future of a stitching finish. 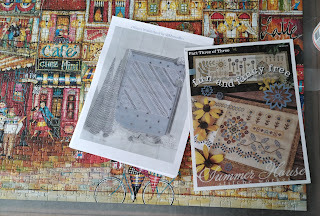 I went out to another stitching night at A Stitcher's Garden and had a great time. 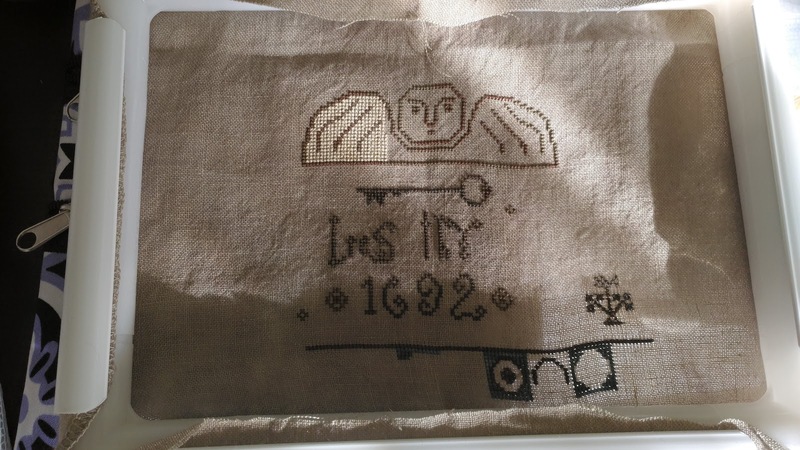 I even stopped by yesterday for a few hour to stitch with Gail, Sue, and Jan. Maybe I should study? The photo does not do the colors justice. 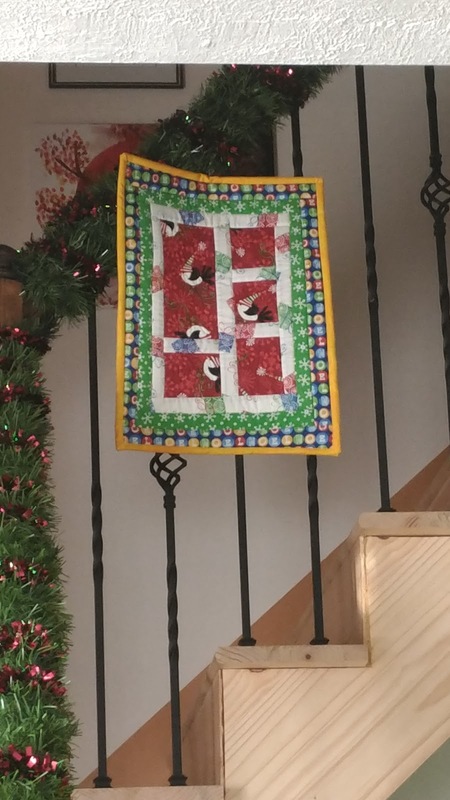 The fabric in the upper left corner of the photo is the back of the backing. It is so shiny and gorgeous. 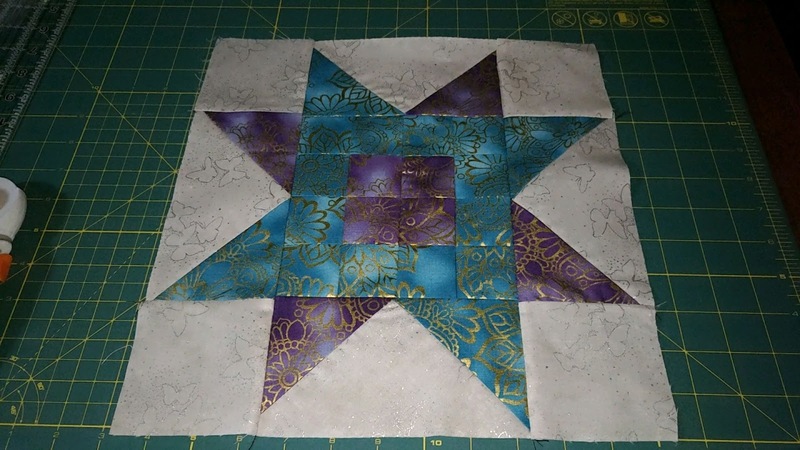 I think I will be using teal thread for the quilting so it will show on the white. I haven't quite decided yet. In the meantime, time to take another two steps by studing a bit more for my exam. Welcome to 2019! My goal for this year is to not take any classes for credit for work . Not that I don't love learning, but I would like to live a little poutside my work hours for a bit! 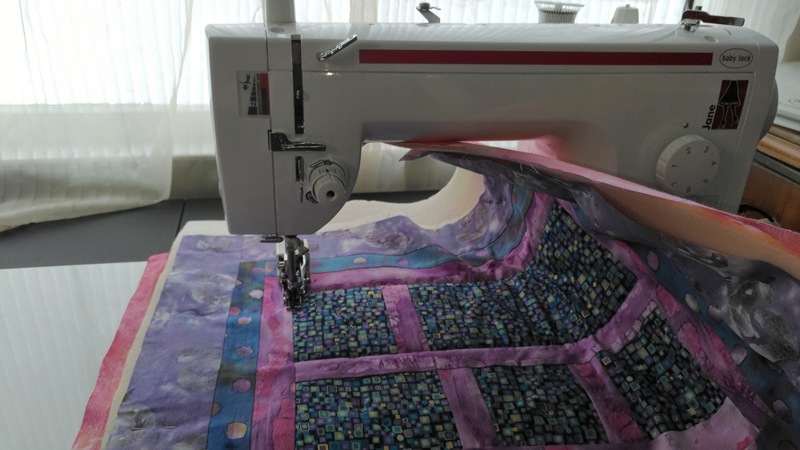 And I would like to take some classes in stitching and quilting! 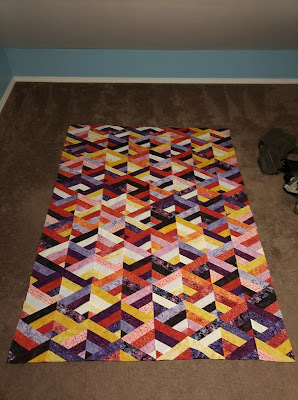 In the first week of this new year I put together a full quilt top. This is my first ever big quilt. I still need to sandwich, baste, quilt and bind it...no small feat. I'm pretty excited about this. 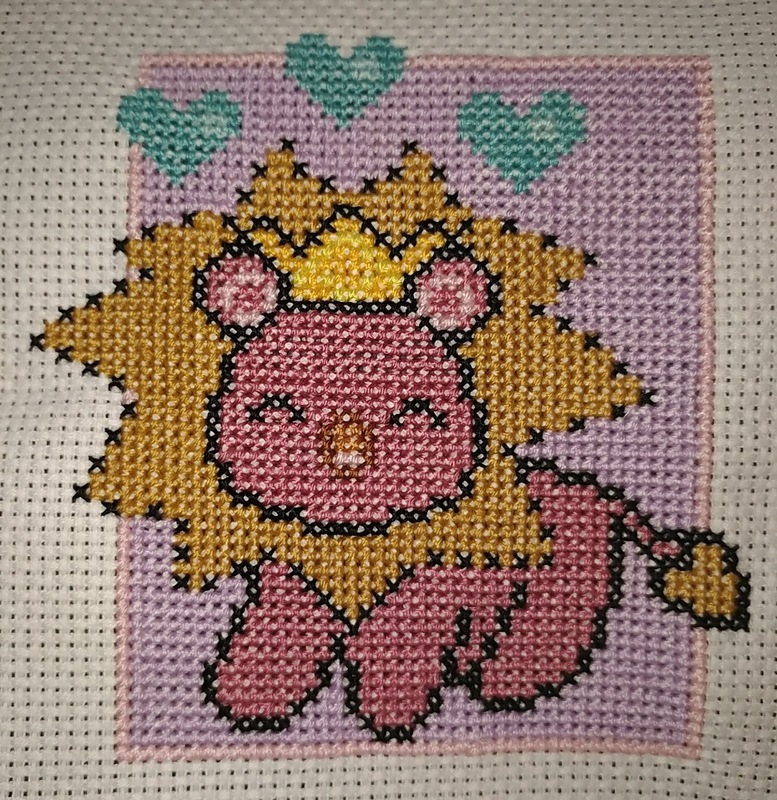 I saw this pattern online and figured out how to assemble it without a pattern. I'm feeling pretty good about how it looks. I learned so much assembling this. 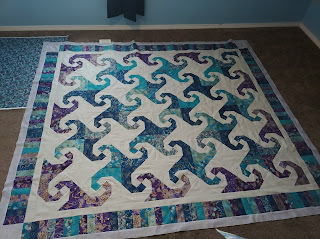 My next quilt top should be even better! 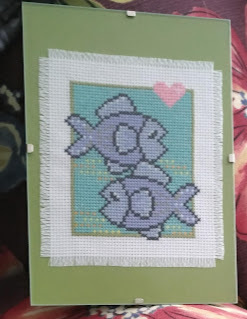 I have one that I am planning to complete for my bed, but I wanted to try something else first so I don't mess up too much on the one I will be sleeping with every night. 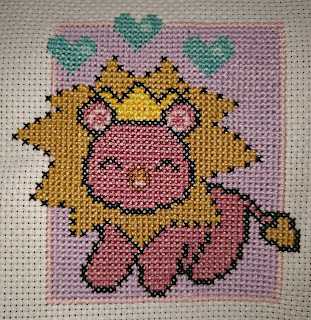 I also finished up the last of the Zodiac sign projects which I bought from Thailand. I find it amusing that the Thai company did Zodiac signs. It came out pretty good. 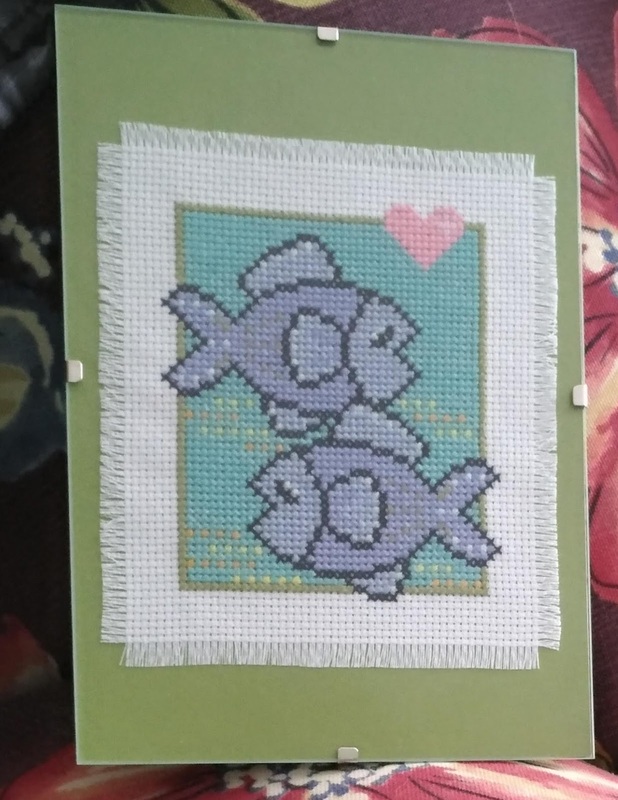 I am in the middle of studying for some certification exams, so I won't be able to stitch a lot during the first quarter of the year. 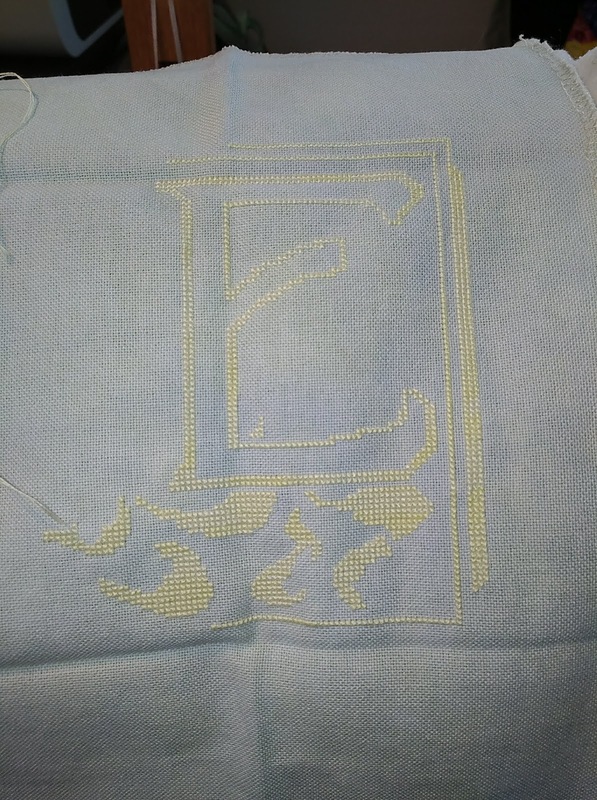 But I am planning to start another letter in the art deco alphabet (Black & White) and finish Thy Needle. 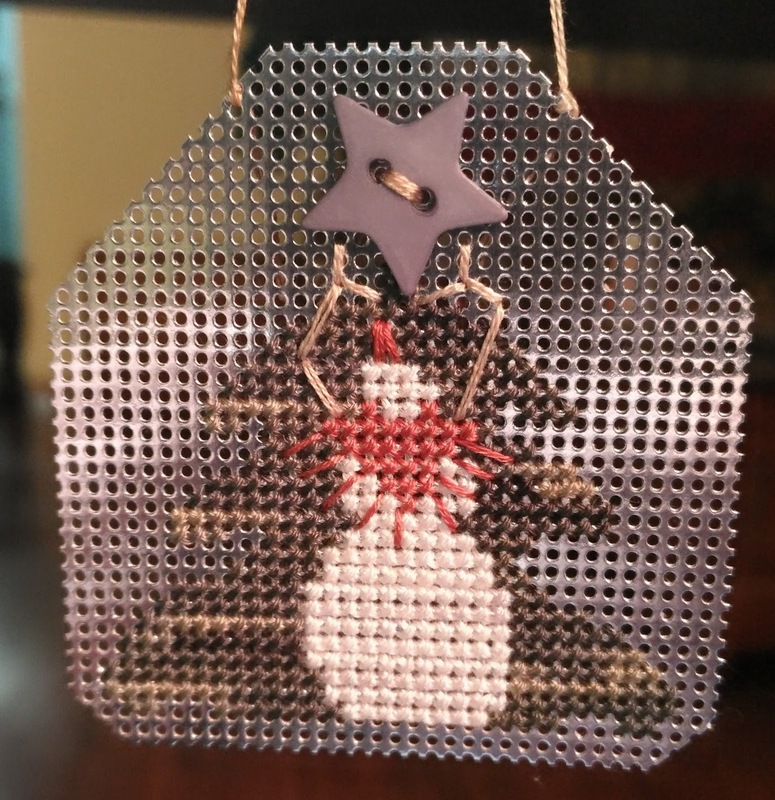 So just a short little post as all the holiday hub-bub is keeping me quite busy. I decided to try quilting again now that I have my new sewing machine. 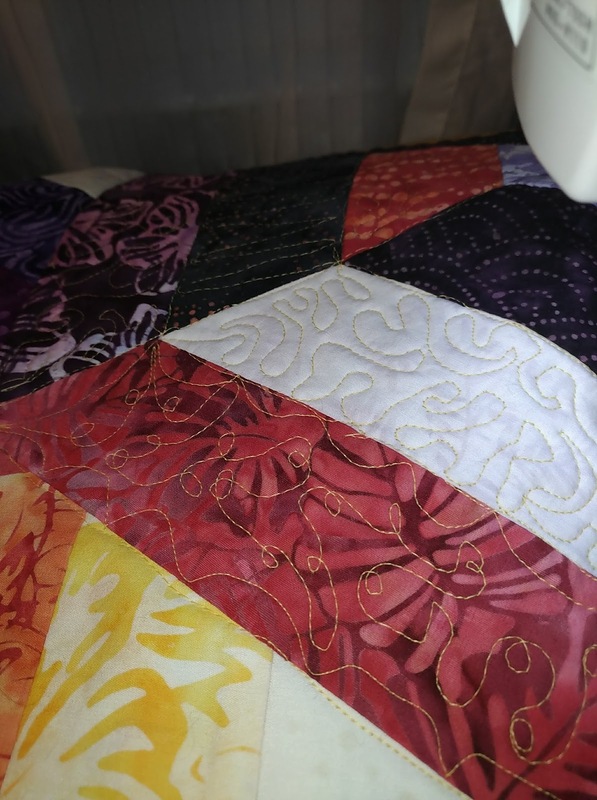 This week I made my first real quilt block. 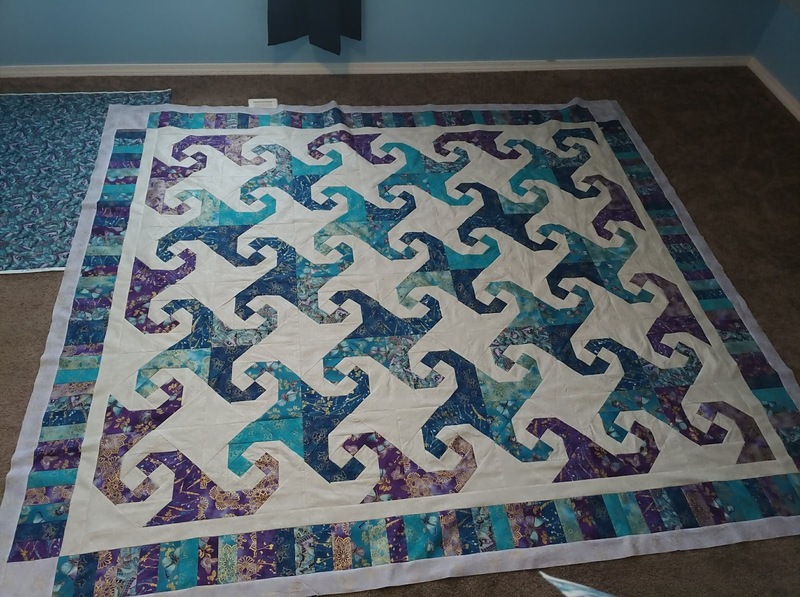 It may end up going in a full size quilt, or I may make a pillow cover from it and some other peices I have, or something else entirely. I am practicing for the quilt I decided to make for my bed. I am rather amazed at how it came out! I hope everyone's holidays are amazing...and 2019 holds nothing but good in store! I discovered working on silver performated paper rates with stabbing yourself in the eye with a spoon. The reflection off the paper was difficult to work with using indorr lighting. This might have been better made during the summer on a lovely 75 degree day while sitting under a tree in the shade. But now I am wiser...and have a cute little ornament. I decided not to finish the back of it so the lights from my tree would twinkle through the holes. It looks fantastic up. I do suggest using the perforated paper for ornaments because finishing is as easy as trimming the edges, but again not with strong indoor lighting on reflective paper. Also, I assembled a puzzle (which you can see in the background above). 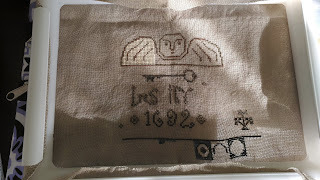 I even found some time to go to A Stitcher's Garden bi-monthly stitch in last night! It was great seeing everyone and enjoying some odd and interesting conversation while stitching the night away! Today is a cleaning and studying day, but I will hopefully be working a bit on stitching tomorrow :-D.
The last few weeks have been quite busy. It seems that everyone I speak with feels like they are in over their head with tasks. Likely it is in part due to the early season winter storms that came through. I thought I was prepared for winter; I had brought everything in, emptied my exterior water pipes, and even gotten all of my snow gear out. However, living in a town house for 6 years and an apparent for 2 years before that made me forget one important item: no one would be coming to clear my driveway! So it snowed and I woke up to 8 inches and got my shovel and went out to clear my driveway...and remembered that I just had shoulder surgery and can't shovel. Surprise! Of course this was the day before I was scheduled to have my snow tires swapped in. I muddled through thanks to a delightful neighbor who brough his snow blower over and then pushed my car out of the driveway. I ordered a snow blower which I assembled today (40 degrees and rainy for that). I even ordered some snow melt. Good for me. Despite all of the busy between work and the catch-up winter prep (the snow really was gorgeous and so much less mud in my house), I still was able to get in a bit of stitching. It turns out that I am maybe not so awesome at quilting yet. I plan to get better, but don't yet know when I will be able to budget some time to work on that. I have some exams I probably should get around to studying for first. Currently I'm taking a quick break from it all to work on a jigsaw puzzle and enjoy the sun through the window.